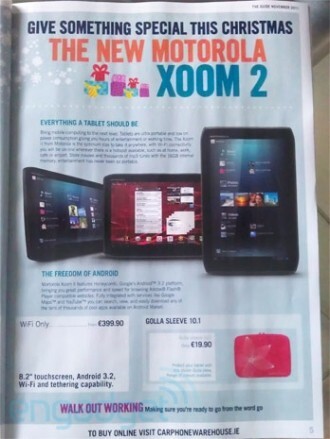 Motorola’s upcoming Xoom 2 tablet has leaked in a flyer from Carphone Warehouse. The ad suggests that we can expect the tablet to launch before Christmas at €399.90 ($546), in Ireland at least. The low resolution ad is difficult to read but it does reveal a few key bits of information. The Xoom 2, or at least one version, will feature an 8.2-inch touchscreen and comes bundled with Android 3.2. Those who were hoping for Ice Cream Sandwich seem to be out of luck, but we suspect that the tablet would eventually get the OS update in early 2012. Aside from the disappointing operating system choice, the device in the ad features Wi-Fi and tethering capability. It looks as if the remaining specs were either censored or not yet available when the ad went to print. The flyer is likely the real deal, as images of the tablet match those that were leaked in September, complete with angled corners. Most expect 4G LTE network support and we are hopeful that Nvidia’s quad-core Tegra 3 processor, codenamed Kal-El, will finally hit the market. At this point, shipping a highly anticipated tablet with a Tegra 2 processor would be foolish at best. We would also like to see a higher resolution display than current generation tablets, but this one is unlikely as well. If Apple wasn’t able to get Retina Displays for the iPad 2, we doubt Motorola would be able to pull off a similar feat just a few months later.